Oils and fats have saturated, monounsaturated (MUFA), polyunsaturated (PUFA) and essential fatty acids (EFA). The amount of fat content in vegetable oils, any kind of fat or ghee can be calculated by just selecting the type of oil or fat. 1. Lipids at room temperature that are solid are called fats while those that are liquid are called oils. 2. Oils and fats have saturated, monounsaturated (MUFA), polyunsaturated (PUFA) and essential fatty acids (EFA). 3. 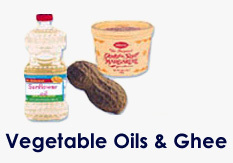 Food items such as sunflower oil, gingley oil, soybean oil, fish etc. containing PUFA should be preferred, yet consumed in moderation. 4. Substitute unsaturated fat - either PUFA or MUFA. Keep your fat calories to about 15-20% of your total calories. 5. People having heart diseases or high blood pressure should use oils and fats that are high in PUFA.